Of his 1962 novel “Mother Night” Kurt Vonnegut said it was the only thing he’d ever written that came with a moral to the story and it is this: “You are what you pretend to be, so be careful what you pretend to be.” Kellyanne Conway has been pretending to defend Donald Trump for so long that she has almost certainly become what she pretends to be, an earnest apologist for this evil “president.” Probably few people know this better than Kellyanne’s husband, George. When New York Times reporter Maggie Haberman tweeted on Wednesday that Speaker Nancy Pelosi has leverage over Trump, as history’s longest government shutdown rolls monotonously on, George Conway tweeted: “No one needs him. It’s just that some people haven’t figured it out yet.” Could “some people” have been a veiled reference to George’s own wife Kellyanne? George Conway’s contempt for Donald Trump is not secret of course. 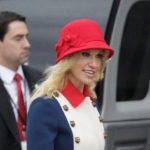 Kellyanne Conway is the third member of that puzzling triumvirate of fascists-for-hire, including Ann Coulter and Katie Hopkins (who is the British Ann Coulter), but Kellyanne is the only one of the three who’s parlayed her hate-mongering disparagements into an actual government job. On Monday, Conway disingenuously dismissed the Washington Post’s claim that Trump went to “extraordinary” lengths to conceal his discussions with Vladimir Putin, including concealing the notes from his interpreter after a meeting with Putin in 2017. Conway’s laugh-out-loud excuse was Trump was worried about a security leak. There is no question that Kellyanne Conway knows perfectly well that the awful man she so faithfully and consistently defends is an evil sack of crap. But then she won’t be the first person to sell her soul for prestige and money. But when the day of judgment arrives, Kellyanne’s modified Nuremberg defense, “I was only pretending to follow orders,” isn’t going to work either. Like many others in the Trump administration, including Trump himself, Kellyanne Conway is probably headed for prison.